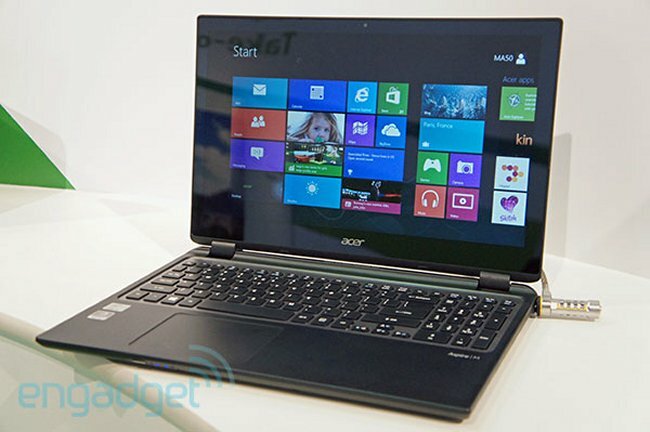 Acer’s newest two Ultrabooks have touchscreens. They are touch-enabled versions of the Aspire M3 Ultrabook and Aspire V5 thin-and-light. There is no info on price or availability yet, but we have some specs. The Aspire M3 Touch has a frameless, 15.6-inch screen, and the same aluminum design as the older M3. The addition of the touchscreen means that its chassis has widened to 22mm thick. It will still be offered with Ivy Bridge processors and discrete NVIDIA graphics. The Aspire V5 Touch laptops will be sold with 14 and 15 inch screens. Just like the former, the design resembles the already available V5 laptops, but with a bit of extra weight due to the touchscreen. The touchpads measure a little under 23mm thick, and weigh 2.1kg and 2.4kg, respectively. It also comes with Ivy Bridge CPUs and discrete NVIDIA graphics.